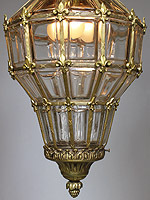 A French Early 20th Century Gilt-Metal Paneled Beveled Glass "Versailles" Style Hanging Twin-Light Lantern. The elongated body topped with a crown-shaped design among floral shields. The gilt-brass sectional panel lining surmounted with flower buttons. 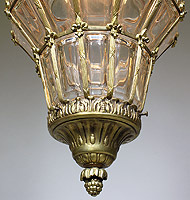 The bottom gilt bronze cap ending with a floral design and an acorn finial. Circa: Paris, 1900. 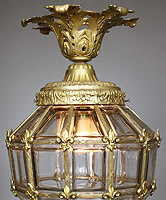 A French Early 20th Century Louis XIV Style Gilt-Bronze and Gilt-Metal Molded Glass "Versailles" Style Three-Light Hanging Hall Lantern. 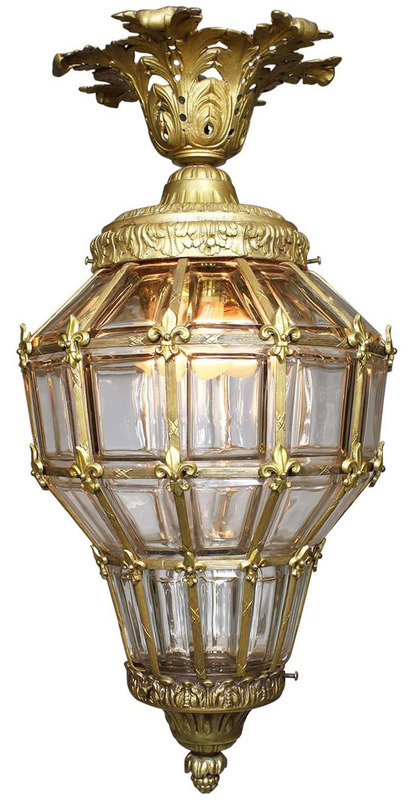 The elongated blown glass body surmounted with a with fleur de lis', banded trims with ties and topped with a floral rosette. The bottom cap with a berry finial. Circa: Paris, 1920.